We gave ourselves only three days to prepare the first ever stage adaptation of Charlotte Brontë’s Shirley to be performed script-in-hand to audiences at the Lass O’Gowrie in Manchester and the Parish Church of Saint Mary the Virgin in Woodkirk, Leeds (as part of the Morley Arts Festival), and, even then – due to prior commitments and a last-minute recast – we were missing a third of the company for our first rehearsal! Three days may seem a reasonable amount of time to rehearse for a reading, but given the length and complexity of the text (still a lot to get to grips with even having been whittled down from Charlotte’s hefty and dense work! ), our approach of editing as we went, the necessity of working out travel logistics and other technicalities, AND the influence of DTK’s characteristic attention to detail, we were flying by the seats of our pants and no mistake! The result was extremely rewarding. Wonderful moments of great depth, pathos and comedy were discovered on the fly, sometimes even during the performances themselves. The performers often played by instinct, lending everything a fresh and energetic feel. Director Helen Parry prioritised perfectly, knowing which moments to guide and shape, and understanding which would fall into place “on the night”. I must say that I absolutely cannot imagine how everything would have come together without Helen’s intuitive and discerning direction! We were lucky enough to play to two very different but equally excellent audiences. The lovely intimate space above the Lass O’Gowrie pub felt full – but not uncomfortably so – and the concentration of the attendees was palpable. The room seemed to buzz! In the larger space at St Mary’s the next day there was a fantastic sense of community and support, and the comedic moments in the text were bolstered by some really rewarding laugh-out-loud responses! I’d really like to take a moment to thank Vicky – the manager at the Lass O’Gowrie who opened the space to us so enthusiastically, Ella Wild, who arranged the slot in the Morley Arts Festival for us, and the vicar at Saint Mary’s, Rev’d Sharon Wilkinson, and her team for making us feel really at home and providing the beautiful venue. The most disappointing thing about the evening was that – as the performance had run over very slightly – the company had to absolutely leg it for the exits after the “curtain call” and summing-up, randomly shaking hands and shouting thanks as we went. Having travelled in from all over – Todmorden, Macclesfield, Salford, Didsbury, Wigan, et al – many cast members were banking on catching the last trains of the day and were likely to be stranded! Luckily everyone made it on time, but that regrettably meant cutting very interesting conversations short. With any luck, we might welcome some returning audience members to the next incarnation of the piece (watch this space!) and find ourselves with a little more time to discuss everything! All in all, the positive responses over the last few days have really helped us to feel like we’ve hit the ground running, so do watch out for future updates about Shirley and other projects! We’ve had a lot to get on with throughout the first few months of 2016, including moving base (we’re still in Greater Manchester), but discussions are still ongoing regarding the future of our latest piece, The Dissolution of Percy, along with other possible future activities, so please do keep your eyes peeled! As a rather belated start to the year, Caroline recently travelled up to Cumbria to deliver one of her talks in the place where she grew up, Sedbergh – a town steeped in history, nestled amongst the Howgill fells, perched on the Yorkshire border. The talk was extremely well-attended and received by members of the Sedbergh Literary Trust, there was a fantastic spread of refreshments laid out and the evening was thoroughly enjoyable. Some fascinating discussions were had after the reading also, especially surrounding events at the Clergy Daughters School in relatively-nearby Cowan Bridge, where the Brontë sisters were schooled, and where the two eldest, Maria and Elizabeth, contracted the tuberculosis that would very shortly end their young lives. Interesting theories were covered surrounding the presence of the Brontës in the area, including the possibility that some of the ideas for their books, including the concept of a foundling child introduced in Emily’s Wuthering Heights, may have been products of the local rumour-mill during the brief time they lived in Cowan Bridge. A story that echoes that of Heathcliff’s discovery on the streets of Liverpool was at that time doing the rounds of nearby Dent village, and may have reached the ears of the then-eight-year-old Emily and remained with her for the rest of her life. It was fantastic to begin to get the ball rolling once more, and we look forward to seeing what the rest of 2016 will bring! Well, now that we’re just about ready to send a summary of our activities over the last few months whizzing back to the Arts Council, we thought we’d share with you a few choice comments from our audience feedback forms. We’re not big-headed, we just appreciate that our audiences have excellent taste! Congratulations to Team Percy for achieving these brilliant results, and many thanks to our audiences for your overwhelming support! In response to those calls for more, do keep an eye on this site, along with our Twitter account (@DTKManc) and our Facebook page (www.facebook.com/DangerousToKnow) as the New Year will bring new opportunities for us, and new ways for you to get involved! Thank you all once again. Happy Holidays, and we’ll see you next year! 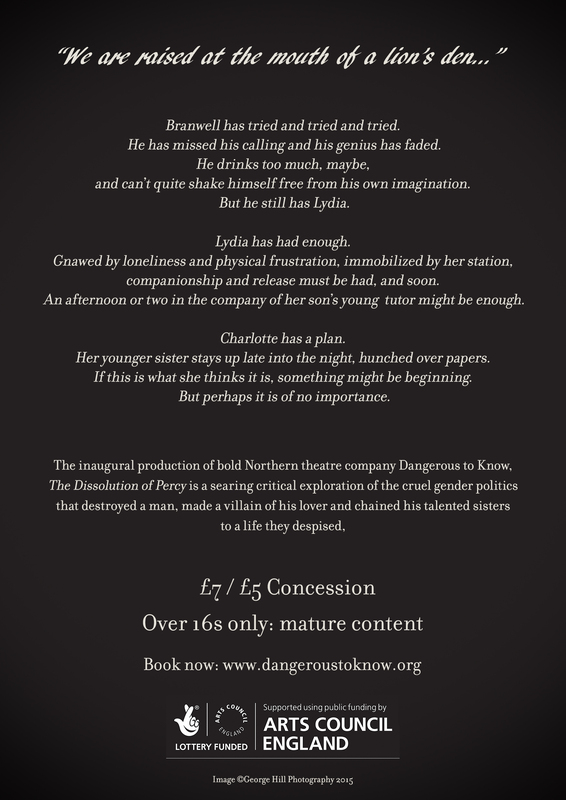 On Wednesday night, Dangerous To Know opened our doors to the public for the first performance in our run of The Dissolution of Percy and, as is always nerve-wracking, we invited press and reviewers to tell us what they thought of our work! Now Frank Hill, a reviewer for RemoteGoat, has delivered, and we are absolutely thrilled. “There’s a painting of the Brontë sisters, posed woodenly around a small table, with a figure standing behind them smeared out of all recognition. This figure was the artist himself, their brother Branwell, who had defaced his own image in some bout of self-loathing. 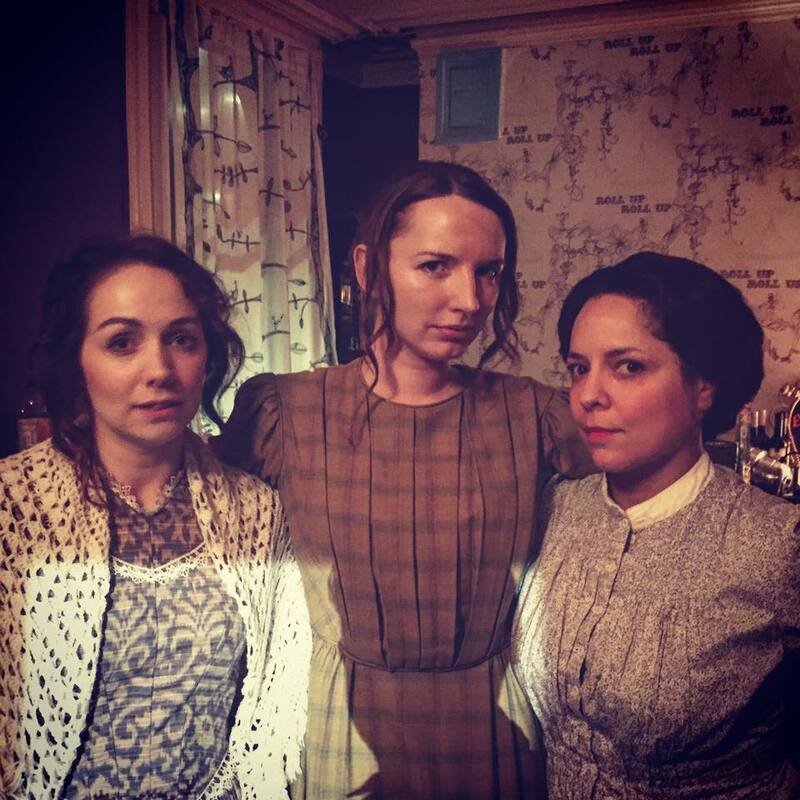 As a student I was fascinated by this ghost-like image hovering ominously in the background, so was particularly interested to see a new play at The Kings Arms, Salford where Branwell takes centre stage. I knew Caroline Lamb’s drama (‘The Dissolution of Percy’) was going to be interesting when one of the sister’s asked where her powder was. Instead of entering with objects from her boudoir she came onstage carrying a gun. The material in question was gunpowder. That’s when I realised this was going to be an unusual perspective on the Brontë women and their much-neglected-by-history brother. The play began at an unusually stable period in Branwell’s life when, thanks to the efforts of his sisters, he had obtained a post as tutor to the Robinson’s family’s son. All seemed well, but it soon became clear that he had not forsaken his spendthrift, drunken ways and stories of his behaviour reached the ears of Mr. Robinson. Although not one to smooth over troubled waters, Branwell managed to retain his position, only to then embark on an affair with the mistress of the house, Lydia. Branwell was a dreamer, trapped in the fantasies of childhood stories and a great admirer of Lord Byron. But without that poet’s panache and fame, being ‘mad, bad and dangerous to know’ could be disastrous. Detached from reality, narcissistic, and drawn to alcohol and laudanum, it became the task of his sisters to save Branwell from himself. But had he already reached the point of no return? The play is about unfulfilled ambition, self denial and desire. It’s well written and tightly structured with fine performances (I’m sure the few occasions when actors spoke over each others lines will soon be ironed out). Alison Flevill, Marcella Hazell and Caroline Lamb brought Jane (Ed. read “Emily”) , Anne and Charlotte vividly to life and Jane Allighan’s sensitive portrayal of Lydia showed a character desperate to survive in a world where wealth and poverty were frighteningly close neighbours – particularly for women in Victorian England. Sean Fitton provided solid support with characters ranging from Rev. Brontë to Branwell’s drinking partner John. But the play stands or falls on the portrayal of Branwell himself, and Sam Redway gave a riveting performance as the vulnerable, selfish, frustrating artist. To give just one example of his skill – I have seen some terrible interpretations of drunkenness on stage – by some renowned actors. It’s extremely difficult to do well and Sam managed to pitch it perfectly, getting the nuances just right. A great performance throughout, and director Helen Parry must take credit for that. Thank you, Frank! It’s wonderful to get this type of feedback for an inaugural production. We hope our work continues to impress for the rest of the run, and for the play’s future life! If you would like tickets to the production, we highly recommend booking in advance via the link below. We thought we’d share these lovely things with you. We’re dead chuffed with them! We’re well into rehearsals now, and the production is shaping up to be a corker! Seats are limited for our performances in Salford (4th – 7 November) and Haworth (14th November), so you’d best CLICK HERE to get booking your tickets! We wouldn’t want you to miss it!